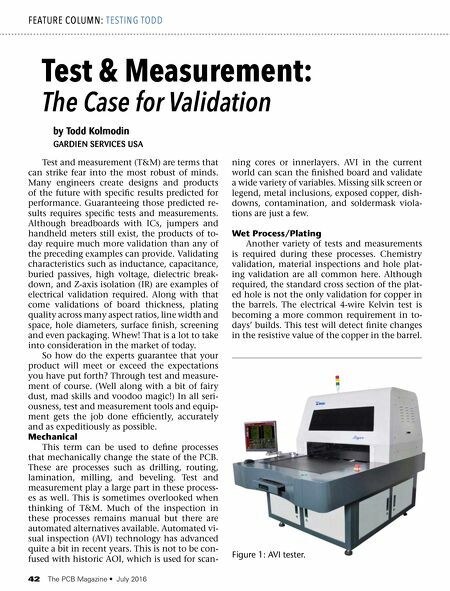 42 The PCB Magazine • July 2016 Test and measurement (T&M) are terms that can strike fear into the most robust of minds. Many engineers create designs and products of the future with specific results predicted for performance. Guaranteeing those predicted re- sults requires specific tests and measurements. Although breadboards with ICs, jumpers and handheld meters still exist, the products of to- day require much more validation than any of the preceding examples can provide. Validating characteristics such as inductance, capacitance, buried passives, high voltage, dielectric break- down, and Z-axis isolation (IR) are examples of electrical validation required. Along with that come validations of board thickness, plating quality across many aspect ratios, line width and space, hole diameters, surface finish, screening and even packaging. Whew! That is a lot to take into consideration in the market of today. So how do the experts guarantee that your product will meet or exceed the expectations you have put forth? Through test and measure- ment of course. (Well along with a bit of fairy dust, mad skills and voodoo magic!) In all seri- ousness, test and measurement tools and equip- ment gets the job done efficiently, accurately and as expeditiously as possible. Mechanical This term can be used to define processes that mechanically change the state of the PCB. These are processes such as drilling, routing, lamination, milling, and beveling. Test and measurement play a large part in these process- es as well. This is sometimes overlooked when thinking of T&M. Much of the inspection in these processes remains manual but there are automated alternatives available. Automated vi- sual inspection (AVI) technology has advanced quite a bit in recent years. This is not to be con- fused with historic AOI, which is used for scan- ning cores or innerlayers. AVI in the current world can scan the finished board and validate a wide variety of variables. Missing silk screen or legend, metal inclusions, exposed copper, dish- downs, contamination, and soldermask viola- tions are just a few. Wet Process/Plating Another variety of tests and measurements is required during these processes. 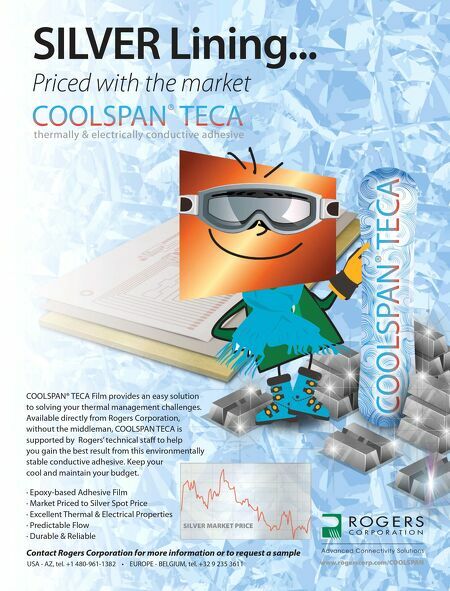 Chemistry validation, material inspections and hole plat- ing validation are all common here. Although required, the standard cross section of the plat- ed hole is not the only validation for copper in the barrels. The electrical 4-wire Kelvin test is becoming a more common requirement in to- days' builds. This test will detect finite changes in the resistive value of the copper in the barrel. by Todd Kolmodin GARDIEN SERVICES USA Test & Measurement: The Case for Validation FEATURE COLUMN: TESTING TODD Figure 1: AVI tester.